How City Colleges of Chicago awarded thousands of degrees to support Mayor Rahm Emanuel's marketing agenda even as enrollment at the community college system tanked. This investigation was published with Crain’s Chicago Business. Mayor Rahm Emanuel often boasts of having “reinvented” City Colleges of Chicago: soaring graduation rates, record numbers of degrees and a community college system transformed into a national model for education reform. But the glowing portrait is largely an illusion — a crash course in data manipulation that has turned the seven-campus community college system into one where it is easier to get a degree but often more difficult to get an education, a Better Government Association investigation has found. Since 2010, City Colleges has watered down its curriculum, violated its own rules on what constitutes a degree, changed the way it counts statistics and bestowed thousands of degrees — sometimes in multiples to the same person — to current and former students who in many cases neither requested nor wanted them, the investigation found. Reinforcing the effort was a telemarketing-style “call center” from which scripted operators sold students past and present on unsought degrees, according to the months-long BGA probe that included dozens of interviews and an examination of correspondence and data obtained from internal City Colleges sources. Critics of the system under Emanuel say much of this was done to create an appearance of success at a college system where enrollment this year hit a 25-year low. “They have manipulated data to score political points on the backs of our students,” said faculty council President Jennifer Alexander when informed of the investigation’s findings. Emanuel, City Colleges Chancellor Juan Salgado and his predecessor, Cheryl Hyman, all declined to be interviewed for this report. But in a prepared statement, Salgado said students clearly benefited from the changes. Underlying that argument is a blizzard of statistics Emanuel recites that conflate graduation rates with the number of completions, though they are not the same thing. “Completions” mark the number of degrees and program certificates awarded in a given year. “Graduation rates” apply only to the small share of students who both attend classes full time and finish program requirements within three years of enrolling. In written answers to questions, the City Colleges’ administration disputed the BGA’s analysis, contending most of the lowered standards had the approval of state regulators, and that any policy violations were the result of isolated mistakes. There is no debate over whether graduation rates and completion numbers are up — they are. But the investigation found that largely the result of a systematic campaign to boost metrics that has given Emanuel ammunition to proclaim in frequent appearances across the nation that the City Colleges’ overhaul is a trend-bucking, higher-education success story. 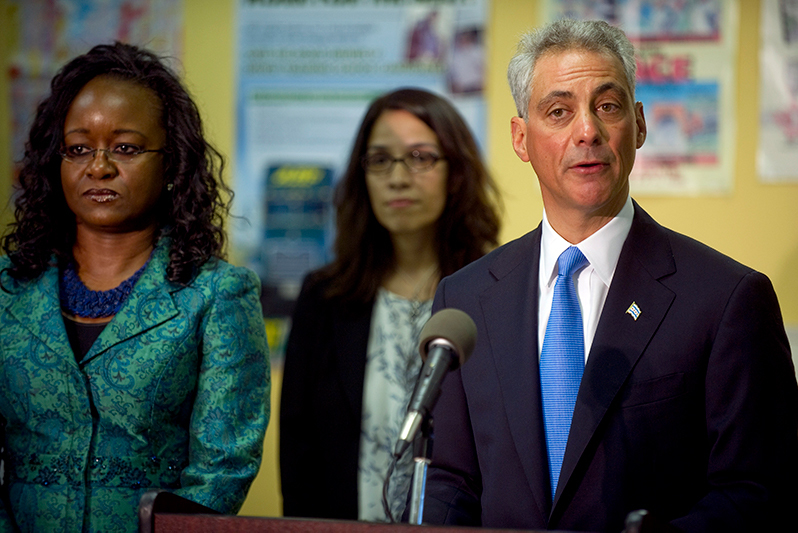 What Emanuel doesn’t talk about is an enrollment freefall at the colleges. The 2017 count of students stood at about 83,000, down 35 percent since he took office in 2011. Declining enrollment is not the only evidence of distress at City Colleges. Longtime chancellor Hyman, a key architect of the changes, left last year following a faculty vote of no confidence. More recently, lagging revenue — in part due to the prolonged state budget standoff — forced the layoffs of 120 administrative employees. The district’s headquarters was also put up for sale. WYCC Ch. 20, the district’s public television station, recently sold its broadcast frequency and may sign off the air. In stark contrast to those problems is the growing numbers of graduates and degrees Emanuel has used as evidence of resounding success. In 2016, the college system reported it awarded 5,010 degrees — more than double the annual count before Emanuel took power in 2011. Over the same time frame, official graduation rates reported to federal education scorekeepers leapt from 7 percent to 17 percent. It might seem incongruous that so many more degrees are awarded while so many fewer students are enrolled. But a closer look reveals how it happened. Records show hundreds of degrees were awarded to students who hadn’t taken classes in years. Some said they were unaware of those degrees — even though the school is required to get recipient consent. “I had no idea,” said 73-year-old Iaponira Barbosa-Lewand, a retired sales manager at Neiman Marcus. Records obtained through the Freedom of Information Act show Barbosa-Lewand was retroactively awarded an Associate in General Studies degree in 2015 based largely on classes she took in the 1990s. In its reporting, the BGA found degree recipients who said they didn’t know they had a degree. Could you be another? A second degree also came as a shock to Marquetta Martin, 26, a sales associate at an athletic apparel store. Martin said she earned an Associate in Arts degree in 2014, but was surprised to learn that college records reflect that in 2015 she was awarded an Associate in General Studies, or AGS. A month later, though, she had both degrees in hand, according to her Facebook account. 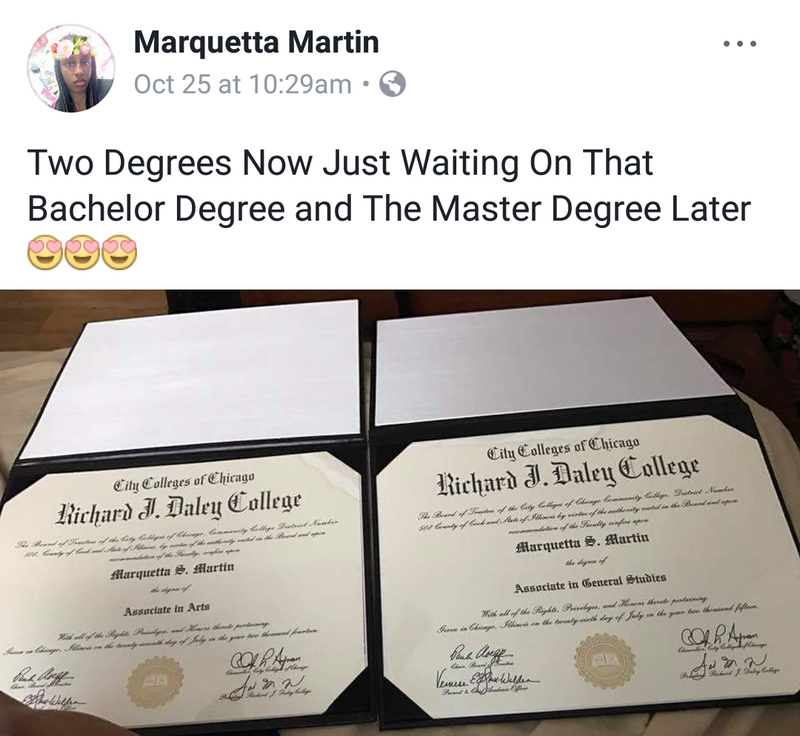 Photos on Martin’s Facebook page show off two City Colleges degrees. The second degree was apparently delivered the day after the BGA asked City Colleges about the missing degree. 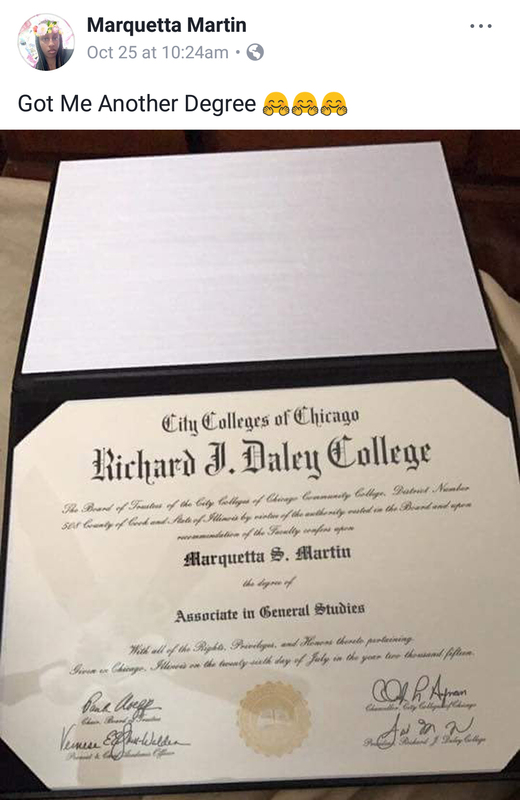 On Oct. 25, one day after the BGA asked a City Colleges spokeswoman about Martin’s missing AGS, Martin posted a photograph of her new AGS diploma. It was dated 2015. The marketing campaign that led to the AGS degrees for Barbosa-Lewand and Martin was part of a program called Reinvention: City Colleges of Chicago, developed by influential and politically connected business leaders and consultants from places such as the Civic Consulting Alliance and the Federal Reserve Bank of Chicago. The idea was to transform the seven campuses — traditionally stepping stones for students looking for affordable transfer credits, adult education or a high-school equivalency diploma — into something akin to vocational schools, where students would learn valuable job skills that could create a built-in workforce to help attract new businesses to Chicago. Emanuel inherited the effort a year later and doubled down. He created a companion program called College to Careers, which sought to bring in corporate sponsors to help develop and teach the curriculum. Within three years, each City Colleges campus was designated a specialty. Kennedy-King in Englewood, for instance, was to concentrate on classes in culinary arts and hospitality. Harry S Truman in the Uptown neighborhood became home to liberal arts and natural sciences. Under the plan, someone working toward a nursing certificate at Olive-Harvey College on the city’s Southeast Side would now have to travel 16 miles for classes to Malcolm X College on the near West Side. Faculty balked, arguing that consolidating study fields in particular campuses was a tone-deaf way to serve a student population filled with many part-timers also raising families and working. In 2015, the system imposed tuition hikes that hit part-timers the hardest. Critics also complained that schools more conveniently located in areas where more white students lived were designated as homes for programs aimed at white-collar professions while blue-collar training went to schools closer to minority neighborhoods. Emanuel brushed aside complaints, arguing that those and other changes led to a college experience of lasting value for students. Among the things driving those numbers was a strategy to steer current students into less-rigorous curriculums. Consider the AGS, the antithesis of what Reinvention designers said they wanted. Until Reinvention, the AGS was rarely awarded at City Colleges. Of the 97 different degree programs listed as part of Emanuel’s College to Careers, only one offers an AGS, according to City Colleges’ website. Still, the AGS degree is experiencing a boom under Reinvention, according to City Colleges records. In 2010, the college system reported handing out just 150 AGS degrees. At its height in 2014, the official count had soared to 1,417. Helping fuel the spike were policy changes that made the AGS easier to get: General education course requirements were reduced from 30 hours to 20 and course requirements for math were eliminated. What’s more, a requirement that students complete at least 21 credit hours in City Colleges’ classrooms to obtain any degree was dropped to 15. That makes it easier to give degrees to transfer students, including “reverse transfers.” Those are one-time students who left the system years earlier for another school. In 2013, the City Colleges’ board made the less-rigorous standards retroactive, applying them to former students who re-enrolled or current students who changed academic programs. It was around that time administrators also began scouring records for current and former students who qualified for degrees under the less-rigorous standards. The administration also began persuading students to seek the AGS degree. The spreadsheet listed 1,350 students who were considered potential AGS candidates because they had already earned enough credits, or were close to doing so if they could be persuaded to change majors. College officials declined repeated requests to explain the purpose behind the database. While City Colleges argues its campaign to promote the AGS falls within the best practices nationally among community colleges, records show the 41 other community colleges in Illinois did not share in the enthusiasm. In 2014, nearly one-third of all degrees awarded by City Colleges were AGS. By contrast, the AGS accounted for just 7.5 percent of degrees awarded by all other community colleges in Illinois, records show. In addition to changes with the AGS, most degrees offered by City Colleges became easier to get under Reinvention, records show. The number of credit hours required for the Associate in Arts and the Associate in Science were both dropped to the minimum allowable by the Illinois Community College Board. The effort to relax requirements also affected some program certificates. For instance, the number of credit hours required for a taxi-driving certificate dropped from six to three. Another path to cooking the numbers involved The French Pastry School, a high-end certificate program that teaches baking and pastry arts out of the system’s Loop headquarters. The graduation rate from the pastry school hovers around 95 percent, likely because at tuition reaching up to $23,700 for the six-month training it is far more expensive than other City Colleges’ programs. Records show City Colleges didn’t count those graduates before 2010. Since Reinvention, however, they have been counted. It is difficult to determine how all these policy changes affected graduation rates without access to comprehensive data for individual students — and City Colleges won’t say. City Colleges has denied BGA requests for the comprehensive student data, arguing it would be “unduly burdensome” to provide those records. The BGA filed a lawsuit Oct. 30 for access to those records. It was one of two lawsuits filed for data related to Emanuel’s claims about impressive strides in education. The BGA also sued the Chicago Public Schools after it refused an open records request for data underlying an assertion by the mayor that record numbers of high schoolers were graduating. City Colleges appears to have repeatedly violated its own rules governing which students qualify for a degree, the investigation also found. For example, the system has a longstanding policy aimed at preventing students from recycling course credits to earn multiple degrees: A second degree requires completion of at least 15 additional credit hours after earning an initial degree. Get hard-hitting BGA investigations straight to your inbox every week. But several students interviewed said they were awarded a second degree without taking the full 15 additional credit hours after the first degree. 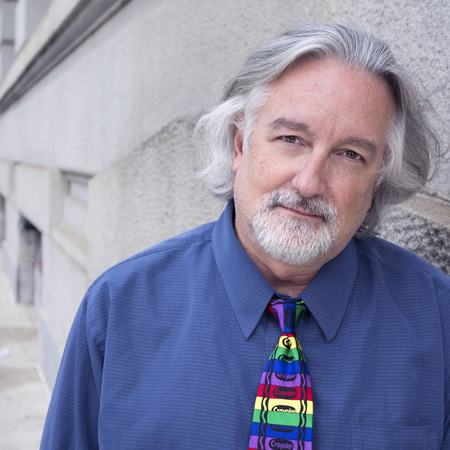 Among them was Kenneth Sapyta, 49, now a substance abuse counselor in the suburbs. According to records, Sapyta obtained an Associate in Applied Sciences degree in 2013, and came back for the AGS in 2015. Sapyta said he only had to take three extra courses, nine credit hours, to get his AGS. Perla Morales, 24, now an engineering student at the University of Illinois at Urbana-Champaign, said she took City Colleges classes only to gain transfer credits. Even so, records show that in 2014 she received two degrees from City Colleges, including an AGS. A BGA review of degrees conferred by City Colleges since 2010 found the number of students who received second and third degrees totaled more than 700 — and the numbers appear to have grown year by year. It is impossible to determine how many degrees were issued in violation of the extra credit hour policy without the comprehensive student data records the college system has refused to disclose. But records show administrators were aware of the potential for problems. In a Sept. 24, 2015 internal memo obtained by the BGA, Alex Underwood, the district director of academic systems, warned that the rule was being ignored in the high-tech push to hunt down potential degree recipients. “This creates an issue with the automation of graduation processing and can result in degrees being awarded in error,” Underwood wrote. Contacted by telephone, Underwood acknowledged writing the memo but declined to answer questions about it. In its written response, City Colleges acknowledged there might have been “human error” in awarding degrees without the necessary requirements. Another example of how metrics were enhanced involves the scouring of City Colleges’ databases to find former students who qualified for degrees they had never sought nor collected. City Colleges reports it issued a total of 2,828 “retroactive” degrees to former students from 2010 through 2016 as part of what it calls an automated conferral program. It marks a massive increase from previous years. Almost half, 1,379, were AGS degrees, records show. The BGA obtained the City Colleges’ database used to track down students who may be eligible for retroactive degrees — a database a City Colleges official acknowledged is updated weekly. One September 2015 version lists nearly 150,000 current and former students. City Colleges’ own analysis, attached to the database, found a total of 3,395 former students who qualified for degrees. The majority — 2,583 — qualified for the AGS. The database also identified 655 then-current students who were seeking a degree other than the AGS and who might be persuaded to accept the AGS. “Contact student to change program,” was the notation next to that finding. Denny Tapia, 22, stopped taking classes at City Colleges in 2016 to complete an electrical engineering major at the University of Illinois at Chicago. Before switching schools, Tapia said he was informed by officials at City Colleges that he could earn an AGS even though it was unrelated to the science curriculum he had been taking. City Colleges emails, obtained by the BGA , reveal internal angst regarding Tapia’s indifference. Another name on the that current-students list was Danuta Thorby. A full-time executive assistant and mother of two, she had been attending City Colleges since 2010 pursuing a nursing career. “Really, I was just going there to get credits to transfer to a four-year college,” said Thorby, 47. “I was going part time, taking baby steps because I have to save money at the same time. Betty Raper, 73, said she got a letter from City Colleges in 2010 informing her of an AGS degree, even though she hadn’t taken a class there since 2003. “Yes, I would like to know how that happened too,” Raper said in a telephone interview. Kidwell is special projects editor at the Better Government Association. Investigations like this take months to produce and aren’t cheap. Will you help us keep going by making a $25 donation? © 2017 Better Government Association, Inc.